I kid Into the Woods because I (do not) love Into the Woods. First things first: Rob Marshall's new adaptation of Stephen Sondheim's classic stage musical was my introduction to this material. I have no background with the show, nor have I ever seen it acted out before now. I suspect that anyone who knows the show and sees this movie will either love it because they recognize the songs or will dislike it because Marshall's version of the Tony award-winning musical fails to capture what is special about it. I agree with the second part. Perhaps you already know the story, which combines at least a half dozen famous fairy tales and explores what happens after "happily ever after." 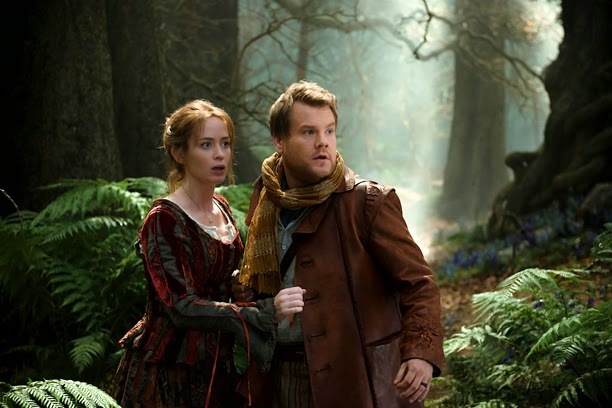 A Baker (James Corden) and his wife (Emily Blunt) learn that they have been cursed by a witch (Meryl Streep) and can't have children -- that is, unless they break the curse by collecting a bunch of items from other fairy tale characters: the slipper of Cinderella (Anna Kendrick), the cow of Jack (of "and the Beanstalk," played Daniel Huttlestone), the golden hair of Rapunzel (Mackenzie Mauzy) and the red cape of Little Red Riding Hood (Lilla Crawford). They all meet and interact...where else? In the woods. 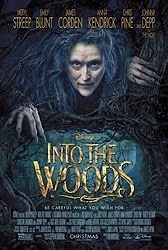 If you were to take a drink every time a character says or sings "in the woods" in this movie, you and at least two generations of your offspring would be dead of alcohol poisoning at about the 90 minute mark. I opened the review with a joke about it, but that's because it's completely accurate: the phrase is repeated so many times that it becomes Sideshow Bob stepping on the rakes, eventually inspiring laughter (though not on purpose) because there's just no other way to process it. And while I recognize that this particular criticism is more fairly pointed at the musical by Sondheim and James Lapine, it speaks to one of the major issues with the movie: it is endlessly repetitive. The sets, while impressive, all look the exact same. The characters each wear a single expression through the whole movie. They don't really change at all, either; while the midpoint finds them (spoiler?) getting what they want, it's all casually upturned in the very next scene. On stage, that's solved with an intermission -- we understand that time has passed and the characters can return for Act II as changed people. On film, it contributes to the sense of total sameness that pervades every single scene. Into the Woods is one note being played again and again and again. We can now definitively say that Rob Marshall is not a good director, right? I will continue to defend his film version of Chicago -- which I think might be the last good movie musical Hollywood has produced -- because Marshall found a way to make it cinematic...though now I suspect it might have actually been the hand of Bob Fosse guiding the choices that worked in that movie, because every Rob Marshall movie since (from Memoirs of a Geisha to Pirates of the Caribbean: On Stranger Tides to even Nine, another musical that doesn't work) has been mediocre at best. There is nothing about his version of Into the Woods that tries to function as a standalone film, save for the casting of many movie stars (including Johnny Depp in a tiresome and incredibly brief cameo). Most of them are all fine but unchanging in their performances. Anna Kendrick wears a single mopey expression. Chris Pine's Prince Charming is fun, but in a completely different movie -- he's the only actor who appears to be commenting on fairy tales instead of living in one. Emily Blunt and James Corden (that's the future Craig Ferguson to you) fare the best because they exude some sense of an inner life, but even they aren't served by Marshall's dramatically inert rendering of this material. And then there's Meryl Streep, who is good because she's Meryl Streep. She gets all the BIG moments in the movie and approaches them with the appropriate BIGNESS. She gets heavily made up in two totally different costumes (the second of which makes her look, as my wife pointed out, like a beautiful drag queen and will likely launch a thousand cosplays) and gets a couple of numbers that range from "nearly poignant" to "would-be show-stopping." But like almost everything else in the movie, Marshall doesn't know what to do with her or the performance except get out of the way, effectively robbing it of any weight. Her exit should be the moment at which the film reaches its emotional fever pitch (I could see exactly how it would play on the stage). Instead, it's limp -- shown but not felt, same as the rest. Like last year's Les Miserables, this movie version of Into the Woods is little more than a package that's put together well by Disney: not only does it have their brand attached (which can no doubt give many of the numerous fairy tale attractions at their theme parks a bump), it has source material that's respected and beloved, an impressive cast, handsome (if numbingly repetitive) production design, an Oscar-nominated director and the "novelty" of being one of the few -- if not only -- big-budget Hollywood musicals released this year. The movie never transcends its own elements, though, and exists more as a pedigree than successful adaptation. It's the movie version of Into the Woods entirely in air quotes -- rich high schoolers putting on an expensive production that fails to take on any life of its own. I have no doubt that there is an audience that will love this film. That's great. It's always better to like a movie than to not like a movie. To be honest, I found myself asking through the entirety of Into the Woods if it wasn't working for me because I just wasn't responding to the material or if it was because the adaptation doesn't work as its own movie. It may be some of both, but I tend to think it's more the latter. Sure, everyone shows up and does a serviceable job, but a big musical that's all about emotions so big they can only be sung -- especially a fantasy musical like this one -- needs to be much more than "serviceable." The joy these characters feels should be explosive; likewise the (much more prevalent) melancholy. It needs huge peaks and valleys. Marshall's version is just a straight line. In the woods. I was fearing that this is what Into the woods was going to be like. Having being burnt with Nine and Maleficent. (SO many things I want to talk about with my problems with Maleficent.) *Annoying auto-biographical side note* I am coming off the meds I have been on for about three years (and slowly coming onto different ones) I am having weird side effects and one of them is lots of emotions. Like all of them in one day or hour. It is very overwhelming for someone who has very little emotions for a considerable amount of time. I actually found myself welling up at the line ' I think might be the last good movie musical Hollywood has produced'. Ah Jesus *hates self*. There have been some really terrible ones, but I would argue there have been some pretty great ones that I have a lot of affection for. This is such a shame that it sounds like this one isn't what I would hope it would be. I swear to God if they do this to Wicked I will go crazy. But you might love it! Hopefully you love it. But how does compare to the last Sondheim adaptation, Sweeney Todd? I enjoyed it; will I enjoy this? I pretty much agree with Patrick's review and I'm a person who liked Sweeney Todd. That one is better than Into the Woods. Thanks, Adam. I still want to check this out, but I'll probably wait to do so. Happy holidays, everyone! I went into the screening unfamiliar with the story, the stage show, or even that it was a musical. Thought the performances were charming enough. The whole theater seemed to enjoy Chris Pine's full-on Shatner caricature. Overall, though, I wish (... I wish... I wish I wish I wish) there was a little more edge in the spirit of the original Grimm tales. This movie is plain mashed potatoes sandwiched between two slices of gummy white bread. For those who are interested, the original Broadway production of Into the Woods (with Bernadette Peters as the Witch) was filmed and is available on iTunes and Amazon Instant Video. It definitely has that "edge" that Ivan is referencing. Pay attention to the Wolf's costume in that production and you'll see what I mean. That same version was also on Netflix, I believe. I'll have to check it out. 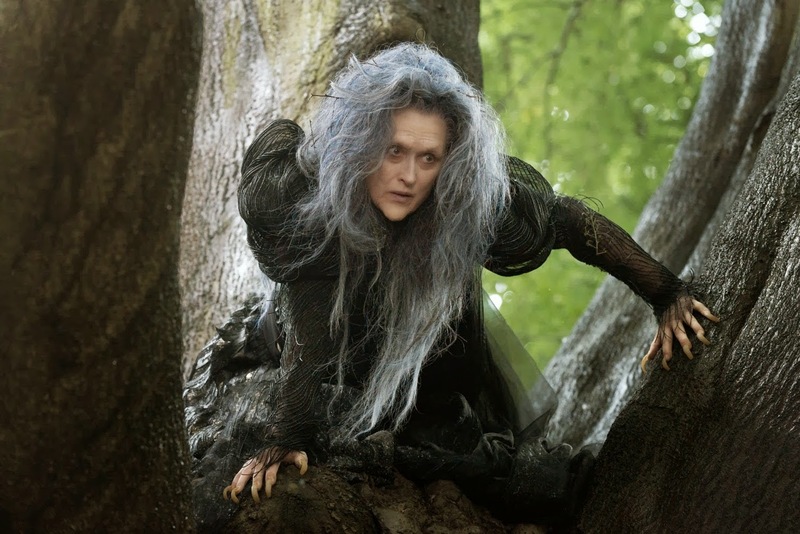 Into The Woods had me appreciating films like Les Miserables and Sweeney Todd a bit more. One for having characters I could care about, with weight, (Les Mis) and the other for having a decent bit of humor with some catchy songs (Todd.) This seemed to fail on both. You nailed it, saying this movie was one note is the best way to describe it. Everything sounded, looked and felt the same for the whole two hours of it. I went to see this movie with my two grand-daughters, ages 11 and 10. We all thought it was too long and probably (about 45 min too long). They were disappointed that it didn't end on a happy note for all. They were very concerned about the little baby crying and wondered where he was going to get milk from:) They also felt betrayed by the prince. I guess this is an adult movie. Don't take kids under 13. I think the film adaptation of the Hairspray musical is pretty damn good. Dr. Horrible is also great, but not sure if it counts as a film. Also all of Disney's animated pictures. There are still some good musicals coming out, but this was not one of them.